I never was a big comic book reader. As a child I never really got into this world as comic books. I read once in a while something of those old Superman stuff but that basically was it. Comic books really never were that big in my life. This also might trace back to the fact that I am living in Germany where this tradition is not that massive or big as in the US. On the level of a subconscious mind of a whole society I would state the hypothesis that, after World War II and the German Autumn filled with terrorism of the Red Army Fraction, there was no big desire to read comics which also have to do with myths of another country and bigger than life heroes. Those comic book worlds and franchises are a terrible mess! I am sure many of you understand everything that’s going on in those franchises, but I don’t. As a result I never became a true comic book fan or at least someone who is interested in this stuff. The quote posted at the beginning of this post from our beloved Comic Book Guy nails this mess perfectly. There are different “franchises” within the different franchises. There are of course different authors with different takes, sometimes swapping between two books or even in one single comic book. Then there’s different universes in which “our” reality is called something like “Earth 90210″, so basically you have the mess multiplied with infinite. And because of the age of those franchises we have massive amounts of character changes, character deaths, resurrections, uncountable amounts of enemies and so on. And to finalize everything we have a nice and wonderful mixture of all those different franchises. We have teaming up stuff as Justice League and yet again different teaming ups in several different fractions and so on. Of course, there are spin-offs as well. If there’s anyone out there who grasps all those things I salute to him. To me it’s a pile of mess you’d have to take on for months or even days to understand and sort everything. The worst part of this absurd situation is the fact that Hollywood seems to be eager to just to the same route as Marvel and DC by using its massive talent for franchises. We already have several big franchises with several movies each which already got a reboot or soon will have one: Batman, Superman, Spiderman, Fantastic Four and Hulk. So basically every Super-Franchise except for X-Men and Iron Man (probably). Of course, there’s also the small superhero movies as Spawn or Ghost Rider. Did I forget something? 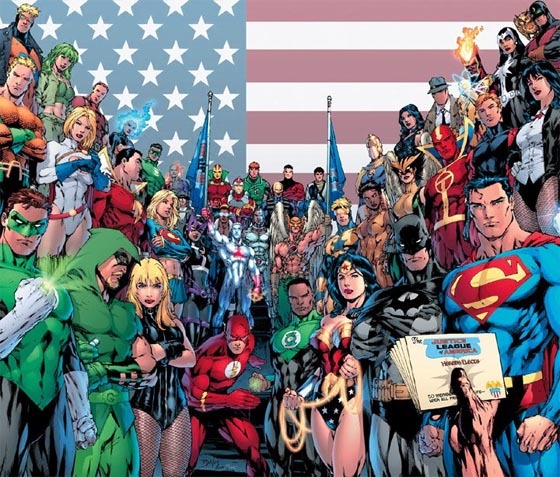 To make things better we soon get several new supers on the silver screen: Flash, Green Lantern and Captain America which themselves will get several movies and one or two reboots. And to make things even better Hollywood will soon completely mix up those several franchises wherever possible and “reasonable” to milk money, as already hinted to at the end of Hulk. As a result we soon will be blessed with the production of Justice League or a similar Mixture Movie (Batman & Superman, Batman & Spiderman…the possibilities are endless). And then, in some years, we will hit the Jackpot when we get several Mixture Movies that combine character from different franchise reboots, while at the same time another reboot of those original franchises with yet another character hit the screen. To illustrate this imagine a Mixture Movie with Superman and Batman. In this movie Batman is played by Christian Bale while at the same time a reboot of the Batman franchise hits the screens. Okay, it’s not that we cannot sort everything out regarding those movies since their numbers are low in comparison to the comic books. Nevertheless I am sure we are facing an utter mess. Comic book geeks or uber geeks might feel right at home since they already know this stuff inside out and do such sorting all the time.